With fall fast approaching, it's time to pull your boat out of the water to store it for next year. As you prepare through your storage to-do list, and reminisce on a summer of marine adventures, you should ensure you have the proper amount and type of boat insurance in place for the off-season. For most operators, this means having boat trailer coverage. Is your boat trailer protected if an accident occurs? Here's what you need to know about this form of protection. Boat trailers help you move your vessel in and out of the water, as well as from point to point on dry land. These appendages are generally two feet longer than the boat you have and are strong enough to accommodate the weight of your boat. Boat trailers come in various forms — including galvanized and painted styles — and they require insurance. These are vehicles themselves (in most cases), and they can be very valuable investments. Boat owners who store their vessel on dry land in the colder months should ensure to protect both the trailer and boat by adding proper boat trailer coverage to their policy. 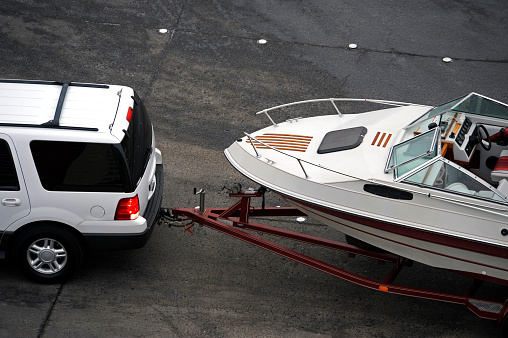 Boat trailer insurance should match your specific use and vehicle type. You can customize the policy, but you should ensure it has two main components. First, the policy should provide you with financial protection from losses related to damage or total loss of your trailer, as this protects your asset's value. This will ensure you're covered if a fire, theft or even a significant accident damages your trailer. Second, you'll need proper liability insurance. This will protect you financially from claims filed against you due to accidents related to your trailer, such as collisions you're deemed to be at-fault for. The proper boat trailer insurance keeps your financials in mind while also lowering your liability risks. Boat insurance does not automatically cover most trailers. However, you can add a trailer endorsement or rider that can both extend the protection you have and help keep your vehicle safe while you are using it. Don't overlook the value of a complete boat insurance package with trailer protection. Stay safe on the water and the road. Call All About Insurance at (817) 589-0006 for a Fort Worth TX boat insurance.